Quick Study: Eugene Ostashevsky is a Leningrad-born poet, humanities professor, and translator who lives in New York and writes in English. The Ostashevsky File: Eugene Ostashevsky is a Russian-American poet and translator based in New York. Ostashevsky’s poetry collections include The Life and Opinions of DJ Spinoza and Iterature, and he served as editor and primary translator of OBERIU: An Anthology of Russian Absurdism, which contains works by such writers as Daniil Kharms and Alexander Vvedensky. 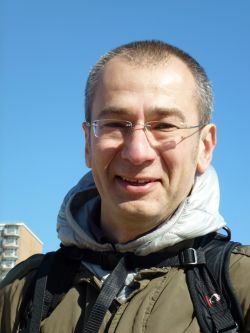 Ostashevsky, who has won several prizes and fellowships for his scholarship, translation, and poetry, teaches humanities in New York University’s Global Liberal Studies program. Ostashevsky’s Places: Leningrad, Russian: born. New York: lives there since 1979, teaches at New York University. Ostashevsky Recommends: Alexander Vvedensky, whom he’s translated, “For me his work is phenomenal, the closest poetry comes to being poetry.” He also praises Nikolai Zabolotsky’s pre-1934 poetry.